The Virginia Home: then, now, and tomorrow. Born into a prominent Virginia family, Mary Tinsley Greenhow was just a teenager when she fell from a horse in the 1860s. The split-second catch of the horse’s hoof on a wooden bridge left the young Richmonder with a paralyzing back injury. She would never recover. Mary soon realized there were people who did not have families offering the same comfort of long-term care that she was given. 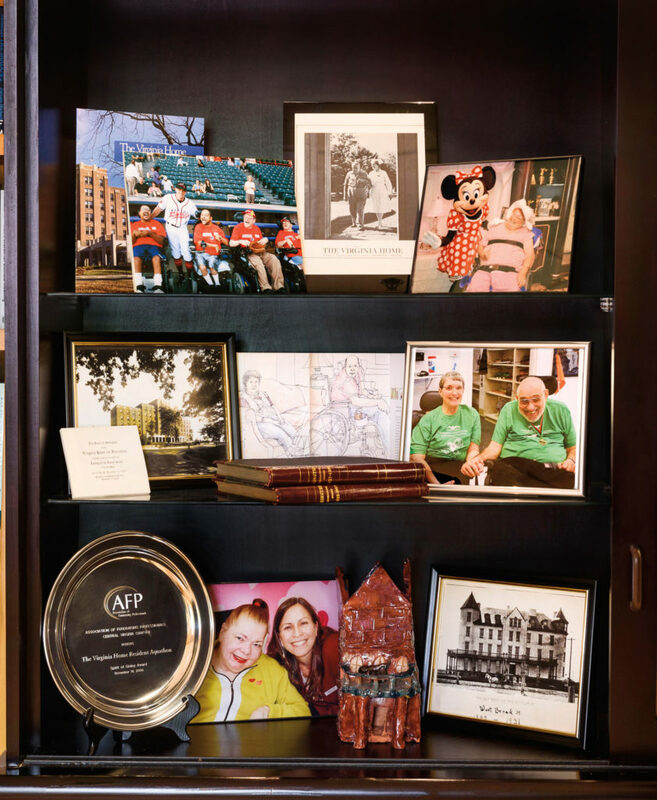 So, Mary’s wheels started turning—she envisioned a place where people with physical disabilities could receive the care, companionship, and security they would need for the rest of their lives. To raise needed funds, Mary began to crochet mats, which she sold to friends and family. The small amount she made from the sale of these mats seeded a fund that subsequently established the first residential care facility for adults with permanent disabilities in Virginia. In 1894, this home, named ‘The Virginia Home for Incurables’ opened on Ross Street with eight residents. Almost immediately, it was filled to capacity. The first Virginia Home still stands today on Governor Street formerly Ross Street) in downtown Richmond, Virginia. 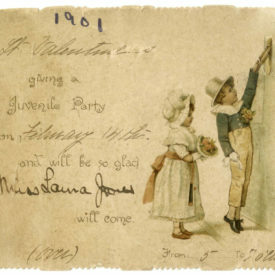 An invitation to a Valentine’s Day Party at The Hotel Jefferson to raise funds for The Virginia Home. Through tireless fundraising and due to overwhelming need, Greenhow’s project quickly expanded. 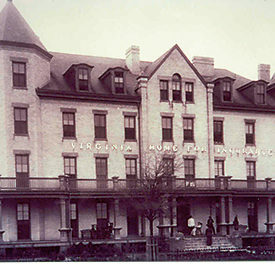 The second Home opened in 1898 at West Broad and Robinson streets. It met its capacity of 59 residents in the mid-1920s. Volunteer doctors provided medical services, and Confederate veterans from the nearby Old Soldiers’ Home often walked over to offer help. 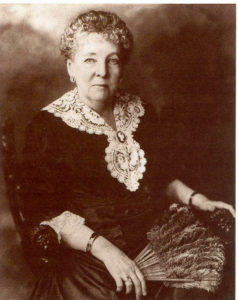 Miss Greenhow remained president of The Home for ten years, with an all-female board overseeing operations and volunteerism, on which the residents relied. The second Virginia Home occupied the entire city block between Mulberry Street and Robinson Street at Broad in Richmond. 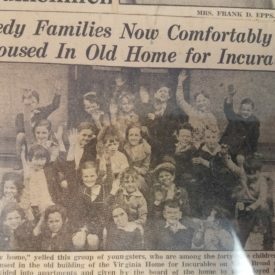 The second location of The Virginia Home became Richmond’s first homeless shelter for families when the third Home opened. The shelter was governed by The Home’s Board of Trustees until it closed after the Great Depression. 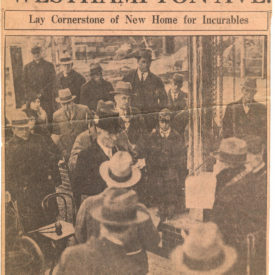 The cornerstone is laid for the third and final location of The Virginia Home. Inside the cornerstone is a time capsule first filled at the second facility, and then added to and placed at the current site. 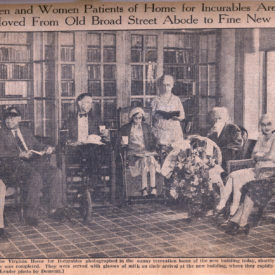 By 1931, The Home yet again outgrew its space and moved to its current Byrd Park neighborhood, where care expanded to about one hundred residents by mid-century. During World War II, militiamen stationed at the park helped attend to residents, often lifting them in and out of bed. 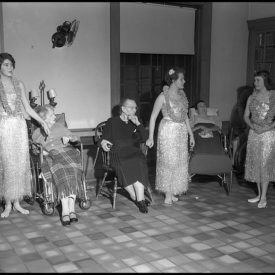 In turn, the residents contributed to the war effort by rolling bandages, sewing, and stripping tin foil. 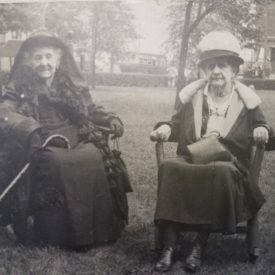 One of the only surviving photos from the current Virginia Home in the 1930s. A luau in the 1940s. Many original parts of The Virginia Home from 1931 have maintained the beautiful quarry tile seen in the recreation photos above and left. 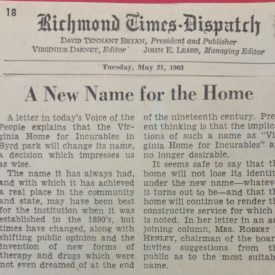 Suggestions from the public were solicited in renaming The Virginia Home. How close we came to being called Greenhow Retreat! 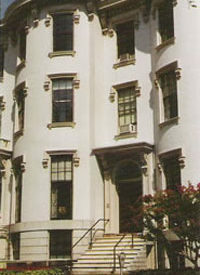 Renamed The Virginia Home in the 1960s, The Virginia Home has since undergone several expansions and numerous improvements. Today, Miss Greenhow’s legacy is a modern, thriving facility home to 130 men and women from every corner of the Commonwealth. The Home remains the only facility of its kind in Virginia, a unique model for residential, therapeutic, and long-term nursing care of adults. With the continued help of our staff, volunteers, board members, donations, and residents, there is no doubt The Virginia Home will remain to serve Virginians with disabilities in the only way we know how—with compassion.